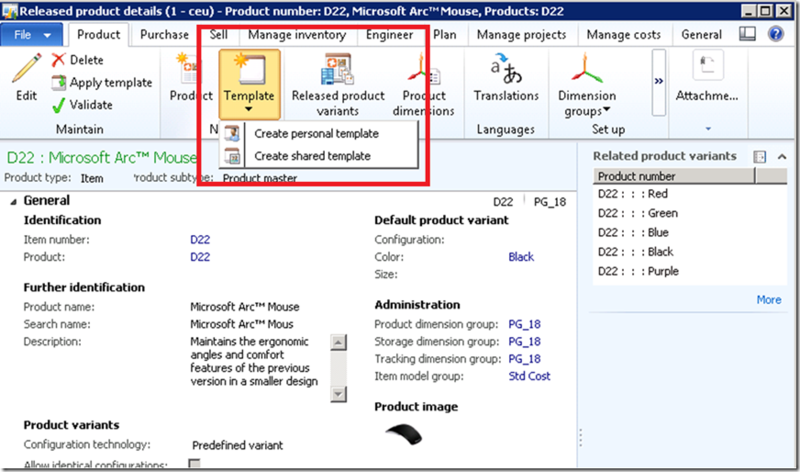 Dynamics AX 2012 provides a new feature that allows you to create and apply product templates to speed up the product creation process. We believe that this is one out of hundreds of small hidden features that will delight our partners and make our end customers more efficient. Traditionally, the Record Templates functionality plays an important role in the user experience during a creation process of key master data entities such as items, customers, and vendors. The system allows you to create a copy of any record in the grid and use it to create a new entity of the same type. This approach helps to ensure data consistency and to establish enterprise process control. 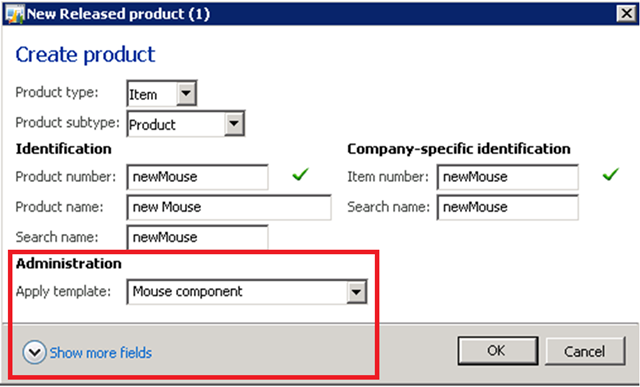 If, for example, you want to create a new engineering component, you can apply a predefined and approved item template that contains data which has been carefully gathered across different departments such as account setup, reservation rules, and dimensions tracking. 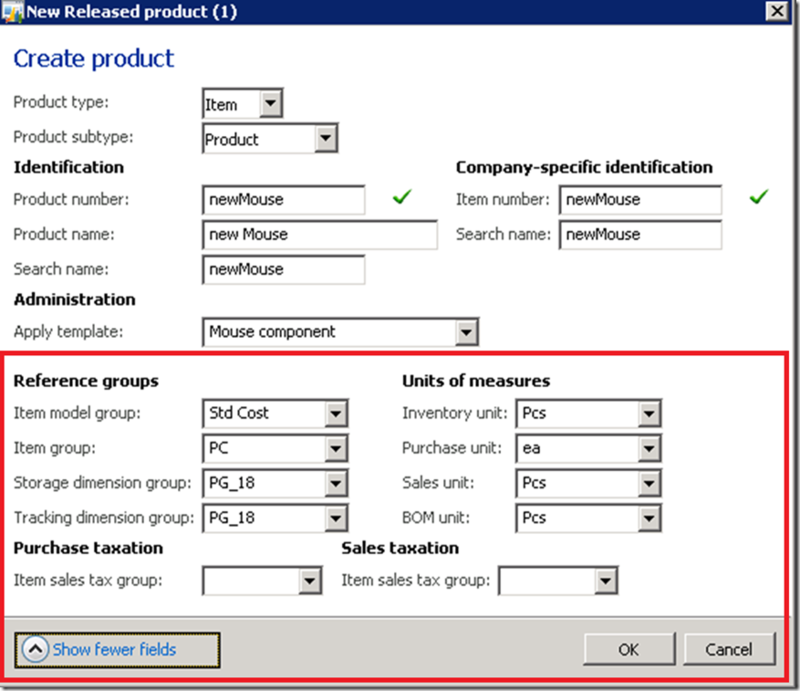 In Dynamics AX 2012, there is a rich and normalized data model behind key entities such as products and released products. This means that when you create a product, multiple tables get updated behind the scene. 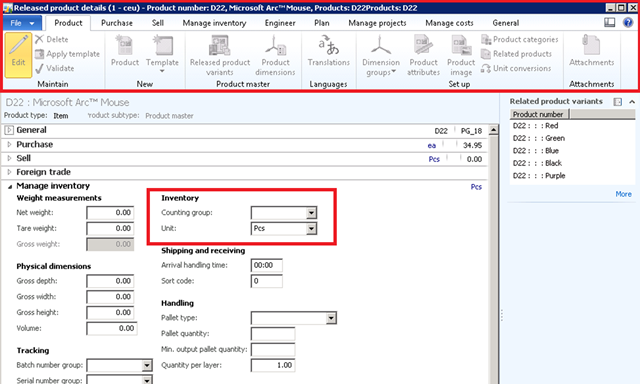 Using a template will help you create uniform product master data in a more intelligent manner. The product template feature in Dynamics AX 2012 takes into account the new data model by extending an old limitation where the template was only associated with one record in one table. 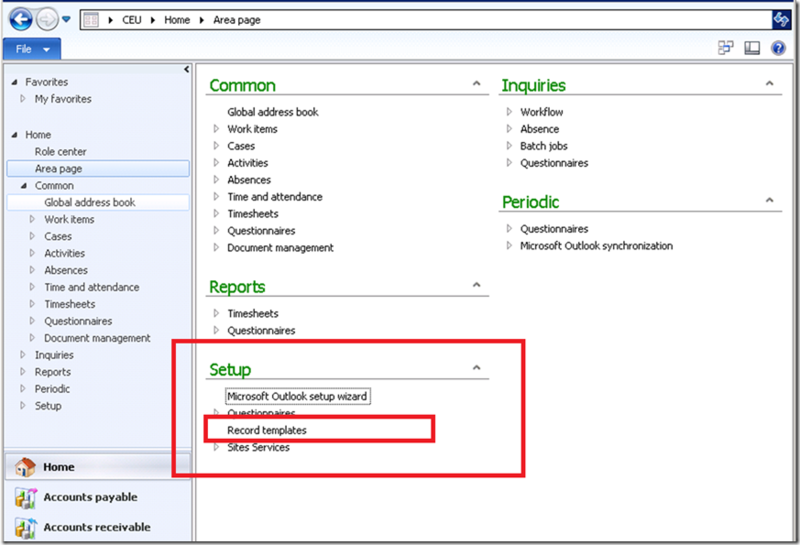 Now, the template can build records from multiple tables and records. To create a new product template, navigate to the Released Product Details Form -> Action Pane -> Template menu. 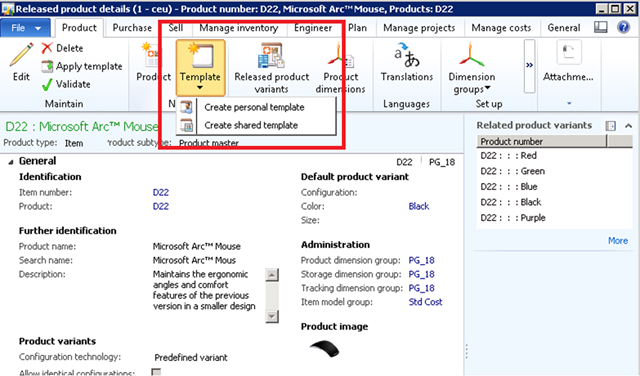 Here you can create a snapshot of the current product entity and save it as a shared product template or as a personal product template. 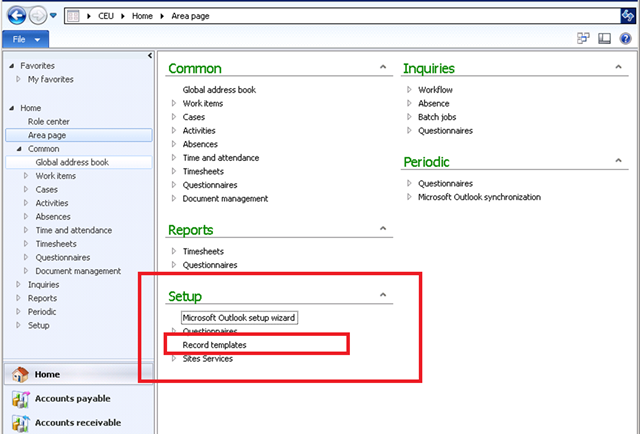 You find the shared product templates under Home -> Area Page -> Setup -> Record Templates. You can edit a shared product template at any time. This means that if, for example, you want to use a different counting group for a given predefined product template, then you do not need to create a new product template. You can just update the existing template. Also, the system allows you to modify the shared product template from the Product details form. This makes it easy to identify all the fields that you want to change. You can select a product template when you create a new released product. Key fields in the product structure are populated by the template. 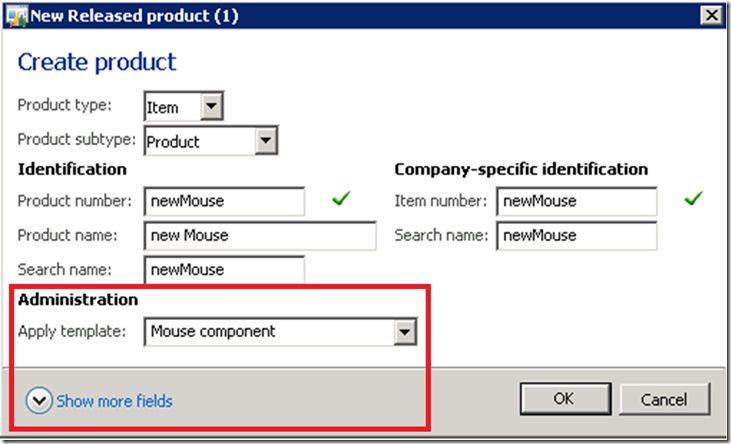 Once you have selected a product template, you can click Show more fields in order to view the important field content that has been provided by the template. You can overwrite template values which are displayed on the form. Please note, that you can view only the most essential fields in this dialog. Rest fields from the template will be automatically applied during the product creation. You can apply and try to re-apply a template from the Released product details form. Every time you apply a template, the system tries to update the various fields of the released product entity. If you have applied a wrong template by mistake during product creation you can easily re-apply the proper template to the same product, rather than delete and create a new product. However, the system runs regular validation logic for all updated fields so if a released product is already in use, any attempt to re-apply the template will fail if the product contains data that don’t match the template. Assume that you have a stocked product with transactions. You try to apply a new version of the template to the product. However, on the template, the Stocked Product policy is not selected which means that products based on the template are non-stocked. In this case, the system will fail during the apply template action. This is because a stocked product with existing inventory transactions cannot be converted to a non-stocked product. When you release a bulk of products in a legal entity, you can apply a template all the products in one go rather than one by one. From the main Release product list page, you select the products where you want to add the template and click Apply template. As you probably know, the recent feature pack contains new, exiting capabilities within retail and process manufacturing industries. And as you might expect, the product template functionality has been extended to accommodate key product data for those industries as well. You can, for example, create and re-use a template that stores retail-specific released product data. 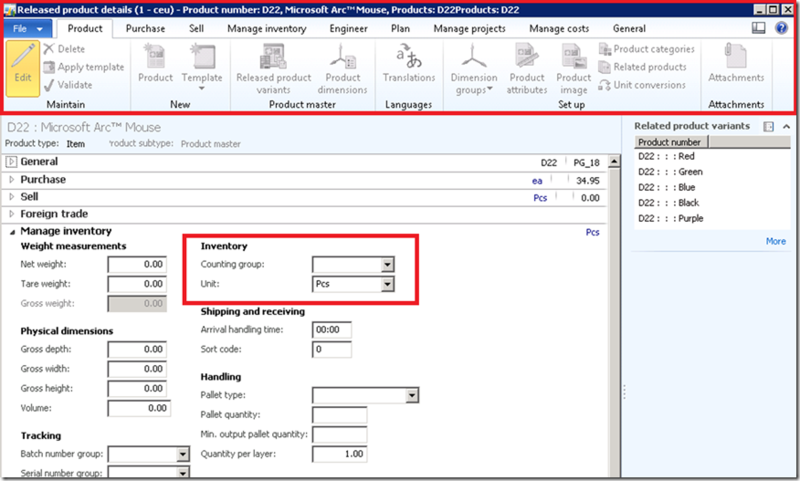 The product master data creation process is an essential part of any ERP product. Going forward we will do our best to make sure that the system offers more intelligent ways to simplify and streamline the product data creation and maintenance processes. Please let us know if you have any specific suggestions on how we can improve the product in this area. We encourage you to join the AX SCM requirements LinkedIn group to either let us know what requirements you see in the field or to answer polls that we setup to gather feedback or by setting up your polls/discussions.This is a great way for you to influence the product direction.